MONTREAL -- NAFTA negotiators are close to completing at least six non-controversial chapters this weekend in their Montreal talks, including ones on digital commerce and anti-corruption, Canadian and Mexican business officials say. The chapters won't be considered formally closed until the three leading political ministers from Canada, the United States and Mexico arrive Sunday to assess the progress. But the possibility of "parking" the chapters -- a trade term that essentially means putting an issue on the shelf and concentrating on other, more contentious ones -- is raising hopes among Mexican and Canadian business leaders that enough incremental progress will be made in Montreal to keep the negotiations alive. The apparent progress sheds light on less controversial aspects of the sprawling 30-chapter NAFTA renegotiation, where Canadian counter-proposals to so-called U.S. poison pills on autos, dispute resolution and a sunset clause are front and centre. Many analysts also view progress on the "low-hanging fruit" of NAFTA as essential. "We think there is a lot of advancement between six and 10 chapters. I didn't say they're going to close them -- a lot of advancement. But the ministers have the last word on that," Moises Kalach, a leading member of the private-sector group that advises the Mexican government on the negotiations, said in an interview Friday. "They call it parking," he said. Perrin Beatty, president of the Canadian Chamber of Commerce, did not dispute Kalach's assessment that six to 10 chapters could be nearing completion. "How many chapters I don't know, but there's scope to close some of the chapters," Beatty said in an interview. "It's when you come down to the more politicized issues it becomes more difficult." E-commerce, anti-corruption, customs and trade facilitation, and the chapter on "Sanitary and Phytosanitary Measures" covering human, animal and plant life are among those chapters, Juan Pablo Castanon Castanon, Beatty's Mexican counterpart, said in an interview. A senior official familiar with the talks disputed the characterization that any chapters are close to being closed or parked. The official spoke on the condition of anonymity because of the sensitivity of the negotiations. The official did say that Canada hoped to make progress in this round on anti-corruption, digital and cross border trade, sanitary and phytosanitary measures, and telecom. Beatty and others said Friday the NAFTA talks could extend into 2019, but added that wasn't a bad thing if slow, steady progress keeps all parties at the bargaining table. "It could well take many months yet, and certainly go into next year," said Beatty. Juan Carlos Baker, Mexico's deputy commerce minister, said: "It's more important to concentrate on the quality of the process and not establish artificial deadlines." Throughout the weekend, NAFTA negotiators will be focused on breaking new ground on some of the most contentious U.S. proposals, hoping to show enough progress to keep Trump from triggering the agreement's six-month exit clause. Canadian negotiators have countered with proposals for higher continental content requirements for automobiles, and on NAFTA's dispute-resolution mechanisms and five-year sunset clause. Quebec's chief NAFTA negotiator said Friday that U.S. Trade Representative Robert Lighthizer will have the final say as to whether Canada's proposals have any traction after he arrives in Montreal on Sunday. 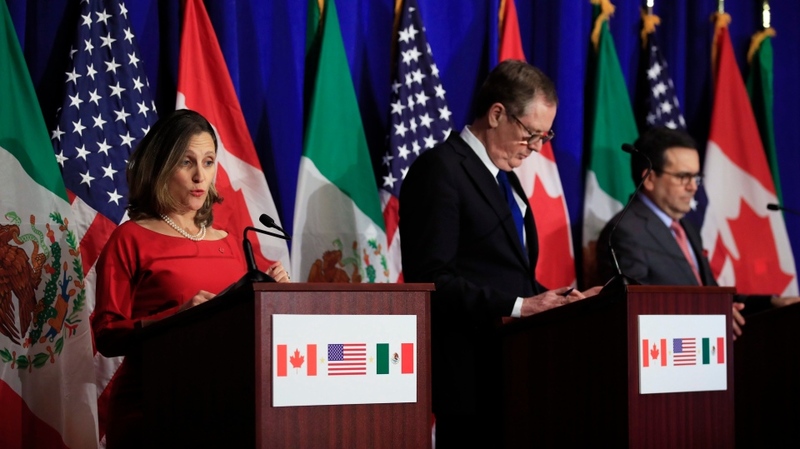 Lighthizer is to close the talks at a joint news conference Monday with Foreign Affairs Minister Chrystia Freeland and their Mexican counterpart, Ildefonso Guajardo. 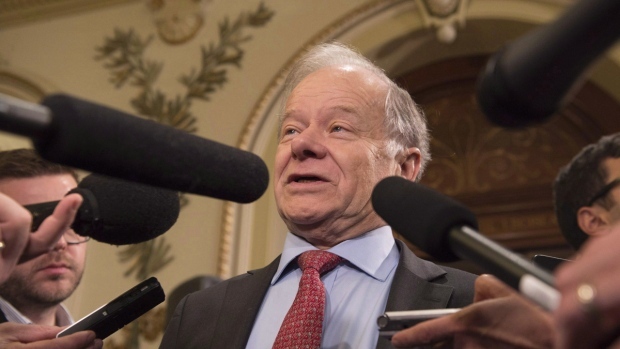 Raymond Bachand, Quebec's chief negotiator and former provincial finance minister, said the Canadian team isn't expecting any formal response from the Americans until they get their marching orders from Lighthizer. Freeland discussed Canada's counter-proposals with Lighthizer in Davos, Switzerland, on Thursday. Canadian officials said he "didn't shoot anything down" but remained otherwise non-committal. U.S. President Donald Trump further muddied the waters on the key question of whether he will withdraw from NAFTA during an interview with CNBC. "NAFTA's a horrible deal. We're renegotiating it. I may terminate NAFTA, I may not. We'll see what happens," Trump said Thursday.